Note: The initiative began in 2005 and concluded in 2013 when the NSDI Cooperative Agreements Program ended. 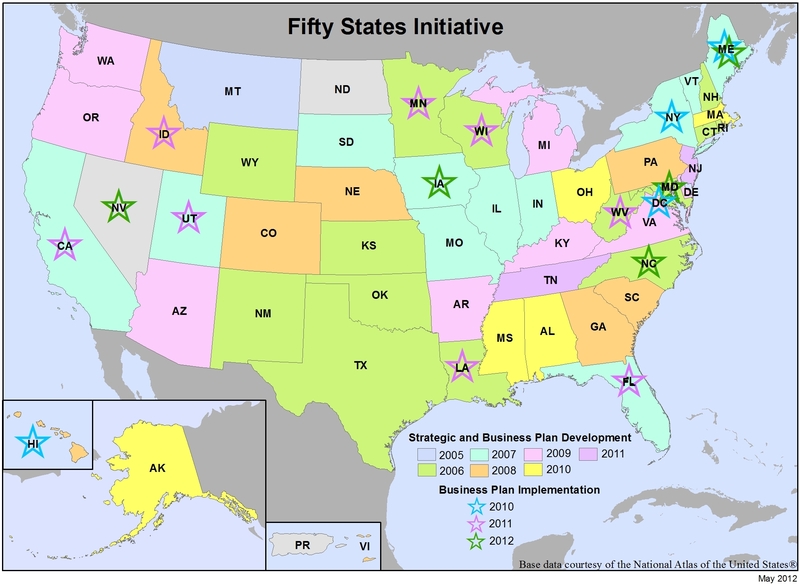 This FGDC initiative supported the development and implementation of statewide strategic and business plans to facilitate the coordination of programs, policies, technologies, and resources that enable the coordination, collection, documentation, discovery, distribution, exchange and maintenance of geospatial information in support of the NSDI. The FGDC worked with the National States Geographic Information Council for the initiative. The work under the initiative was supported by the grants issued by the NSDI Cooperative Agreements Program. The initiative began in 2005 and concluded in 2013 when the NSDI Cooperative Agreements Program ended.